"You who may be momentarily disheartened, remember, life is not meant to be easy. Trials must be borne and grief endured along the way. As you remember that 'with God nothing shall be impossible' (Luke 1:37), know that He is your Father. You are a son or daughter created in His image, entitled through your worthiness to receive revelation to help with your righteous endeavors. You may take upon you the holy name of the Lord. 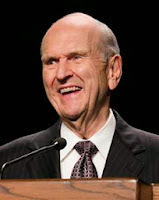 You can qualify to speak in the sacred name of God (see D&C 1:20). 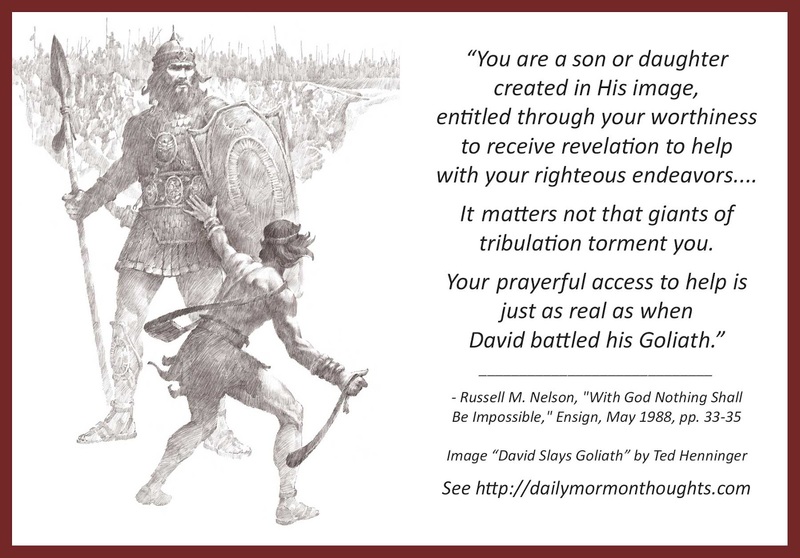 It matters not that giants of tribulation torment you. 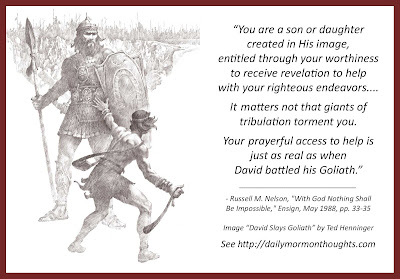 Your prayerful access to help is just as real as when David battled his Goliath (see 1 Sam. 17). "Foster your faith. Fuse your focus with an eye single to the glory of God. 'Be strong and courageous' (2 Chr. 32:7), and you will be given power and protection from on high. 'For I will go before your face,' the Lord declared. 'I will be on your right hand and on your left, and my Spirit shall be in your hearts, and mine angels round about you, to bear you up' (D&C 84:88)." One of the truths of eternity, perhaps, is "life is not meant to be easy." There will be challenges—BIG challenges, comparable to David confronting Goliath. But the corollary truth of eternity would be that we are not left alone to confront such challenges. If we do our part to prepare and be worthy, divine help will always be available in the form of "power and protection from on high." It requires each individual to "foster your faith"—take the steps necessary to develop that trust and confidence in God and His power, through obedience and faithfulness. Then "fuse your focus" by developing "an eye single to the glory of God," having goals and priorities fixed on the things that matter most. Those things don't happen overnight. We grow in strength, faith, power, confidence, and hope as we steadily and continually live the life that leads to Him.